This was probably something that no one saw it coming earlier, but when Brunei went ahead with the implementation of the Syariah law earlier this month, we've been getting a lot of international coverage. 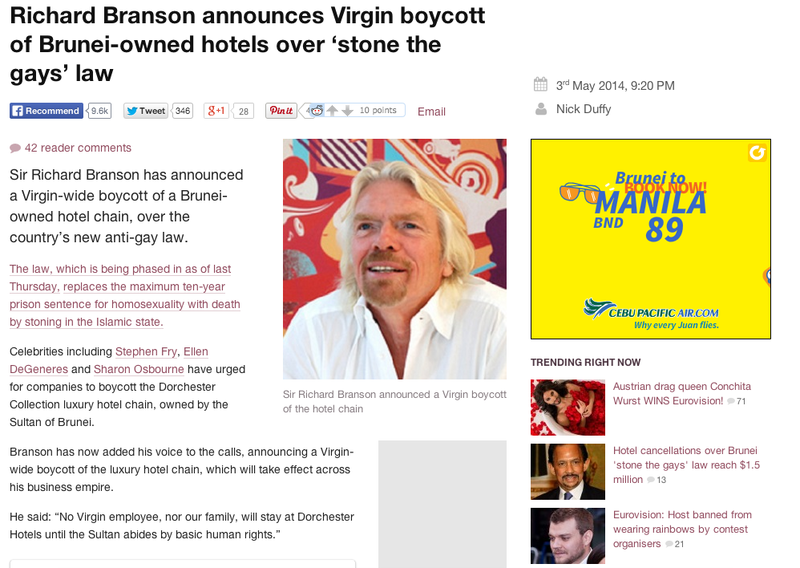 And it started off with LBGT supporters calling for the boycotting of the Beverly Hills Hotel in LA. 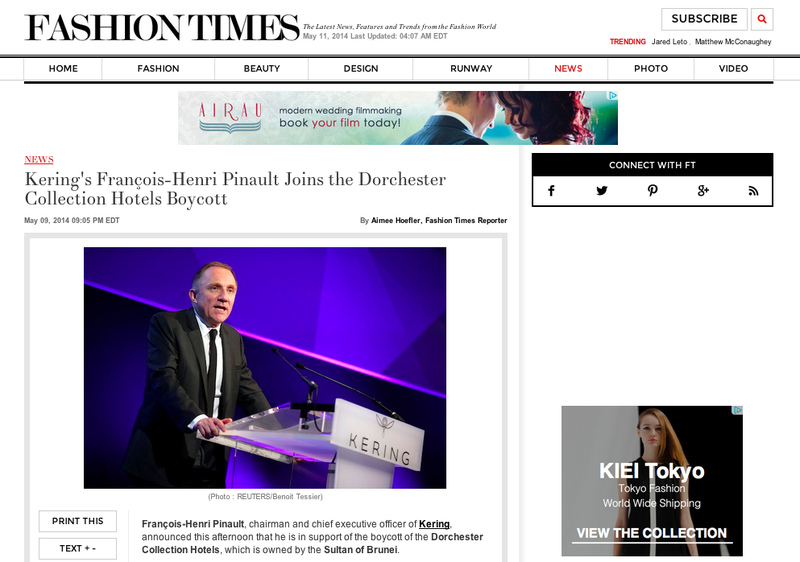 From there onwards, it pretty much snowballed to a bunch of rich and famous people jumping in the boycotting bandwagon of assets owned by the Brunei Investment Agency around the world, particularly hotels under the Dorchester Collection. Perhaps the video that surprised me the most was this video of Japanese protesters outside the Ambassador's Residence of Brunei in Tokyo, Japan. 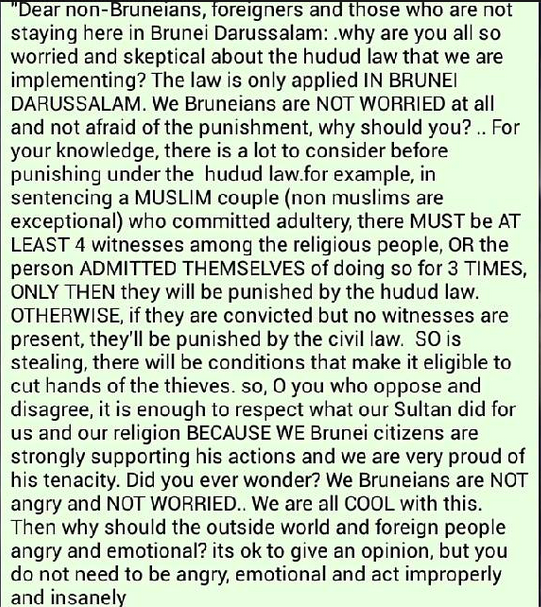 Having born and raised in Brunei, any form of protests in this country is considered very illegal. Mainly also due to the fact that we are still under a Martial Law since 1962. So to actually see people silent protesting outside an official Brunei premise, albeit it being in a foreign soil, is still pretty mind blowing in a way. In a way, all these protests and boycotting about this new law is pretty debatable. I can understand why the western world is outraged about this law because overseas, other countries are working together to give the LGBT community equal rights in society. And here we are, announcing that if you're gay, you'll be subject to punishment if you're caught doing any indecencies in this country. A law that specifically discriminates against the LGBT community just because it is part of their religion. The other point to why people overseas are protesting against this law is also due to the inhumane punishment that awaits if one if caught violating it. Amputations, flogging and the ultimate "jackpot" of being stoned to death awaits them. Hence, the whole subject of violating human rights and what not. Why I say this is debatable is because, Brunei is neither the first nor the only country that implemented the Syariah law. We're probably the latest country to implement it which is why we're getting all the sudden attention. 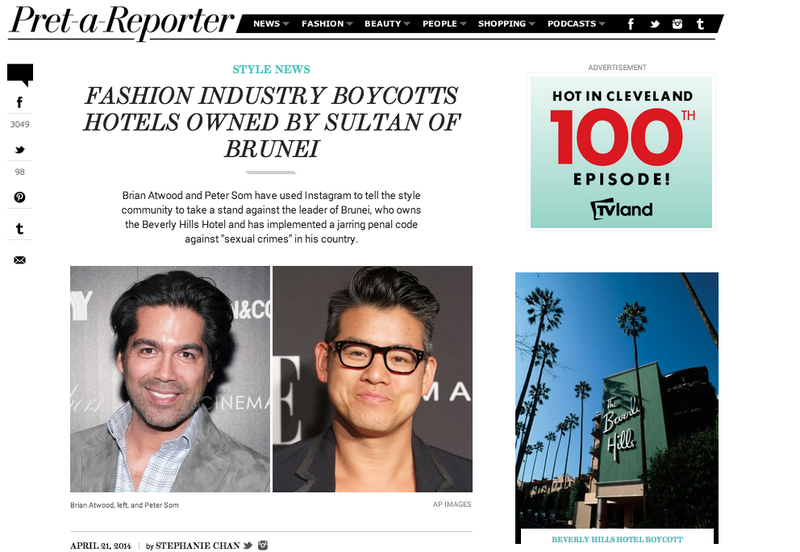 So, one can easily argue that it is rather biased that Brunei owned assets overseas are currently the only one being boycotted. Why aren't they boycotting assets owned by UAE or other countries that also has the Syariah law? Despite all the media attention we're getting internationally, back here in Brunei, people are "uniting" to ward off all the negative attention the country and our ruler is receiving. One of the many pro-Syariah posts circulating and shared among Bruneian on Facebook. 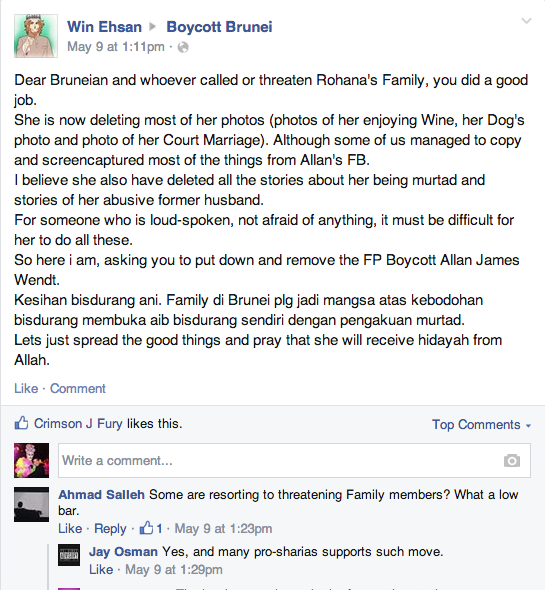 While some chose to express their thoughts and feelings through simple statements, others decide to go to the extreme of creating their own Facebook page calling Bruneians to unite and boycott the companies that are boycotting against them, which I think it's slightly amusing considering we're only a population of 400,000+ people. 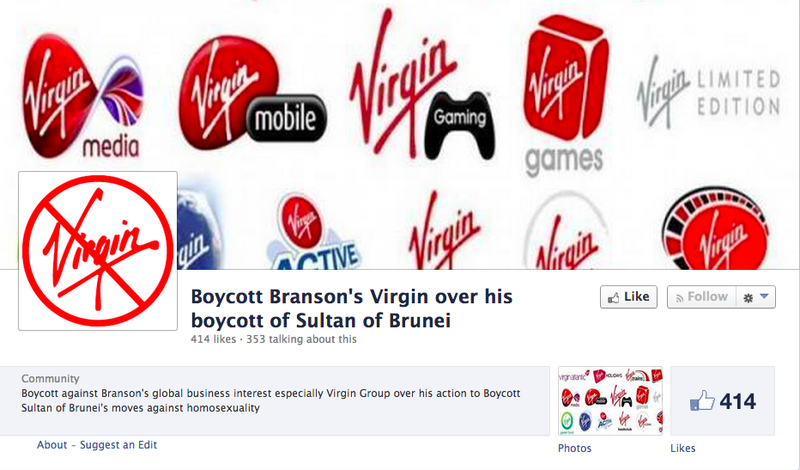 The "Boycott Branson's Virgin over his boycott of Sultan of Brunei" page. 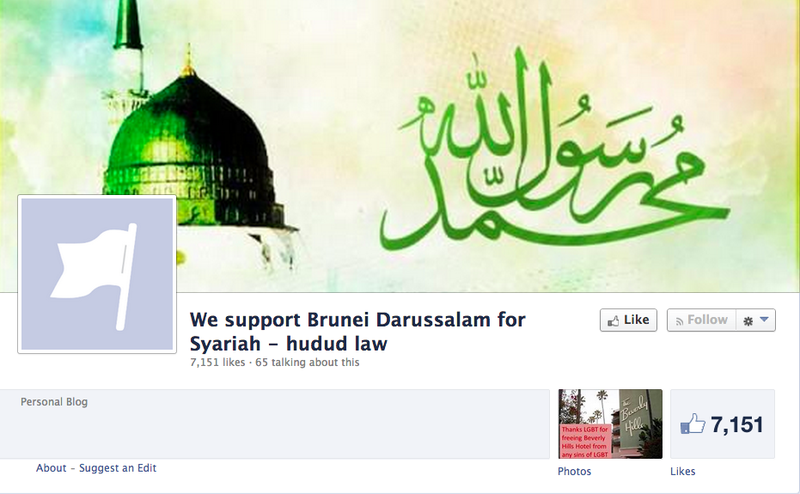 The Pro-Syarah Hudud Law page. As much as I want to applaud our fellow Bruneians who are trying to show the world they're embracing this new law into their lives, unfortunately it seems like a lot of them have expressed themselves in a manner that contradicts what their peaceful religion teaches them. And it's a shame really. Arguments between the pro-Syariah law and the anti-Syariah law people escalating into personal attacks and threats against others. It's only been 11 days into this new law and things are looking pretty chaotic in the online world while in reality, the talk of this new law among one another seems taboo. People discuss and voice their opinion quietly and discreetly. The latest sermon at the local mosques instructs Bruneians to "remain steadfast and united in the face of criticism" and emphasises that those who are anti-Syariah law are ignorant and not well informed about the law. While that is a rather good emphasis made, I personally think it's a little premature to start preaching on it because just days ago, the Sultan himself had to make a royal speech calling to end confusion on the Syariah law. And it seems that's what the situation is still like. Confusion. A lot of people are still misinformed or confused about this new law. Some are saying the law is only applicable to Muslims only but in reality, it is actually applicable to non-Muslims too according to the Syariah Penal Code Order 2013. From the Syariah Penal Code Order 2013. Those who have had a browse at this code would agree with me when I say that there is definitely a lot of work that still needs to be done in terms of clarifying the Syariah law. The English level used in this penal code is just wayyyy too deep for an ordinary person to understand. I'm not sure if it's because I'm not a qualified lawyer to understand the lingos/jargons used or my English is terrible or simply because the person who wrote up this penal code has terrible English. Here's an example. Either way, I still think the media is definitely over-hyping this law for now considering we've only just recently implemented it. And people both locally and abroad are over-reacting because one side claims to be helping us from a human rights perspective, while the other side is refusing help. And all these dramas are unfolding when there's not even any cases yet. Perhaps the wisest move for all is to educate yourself from both perspectives. See as to why there are people who are against this law and why there are some who are for this law. Think logically for yourself and decide for yourself.